Queen and Adam Lambert have announced dates for a summer 2019 Rhapsody tour of North America. In sync with the worldwide success of the biopic, “Bohemian Rhapsody” – which tells the band’s story from their 1970 beginnings to the iconic appearance at 1985’s Live Aid concert – Queen will play a 23-date series of arena and stadium shows starting in Vancouver, BC on July 10. "This is a great opportunity,” explains guitarist Brian May. “Our last tour featured our most ambitious production ever, and got us our best notices ever. So we decided to rip it apart and get even more ambitious! Watch out, America!" 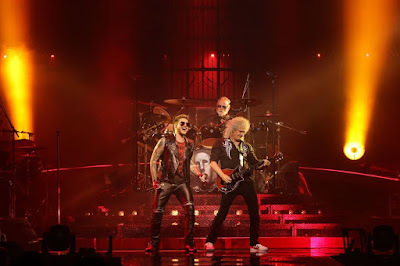 "We have been designing a brand new visual spectacle that will reframe these iconic songs and we are excited to unveil it!," says Lambert, with drummer Roger Taylor adding: “We are ready for America and raring to get back in the saddle." Completing the tour lineup are long-term collaborator Spike Edney on keyboards, Neil Fairclough on bass, and Tyler Warren on percussion. Queen and Adam Lambert fan-club pre-sales will run from 10 a.m. local time through 10 p.m. local time on Thursday, December 6, with general public tickets going on sale starting Friday, December 7 at 10 a.m. local time via the usual outlets.